AMD has very quietly launched a brand new graphics card: the Radeon Pro V340 (via Benchlife via Videocardz). Here’s the thing though, this is almost certainly not a 7nm card, otherwise we would have seen it at Computex 2018 when AMD demoed the 7nm Vega Instinct. Instead, as VCZ found out, it is a dual Vega 10 Multi-GPU solution with 16 GB +16 GB (or 32 GB) HBM2 on each Vega 10 GPU die. 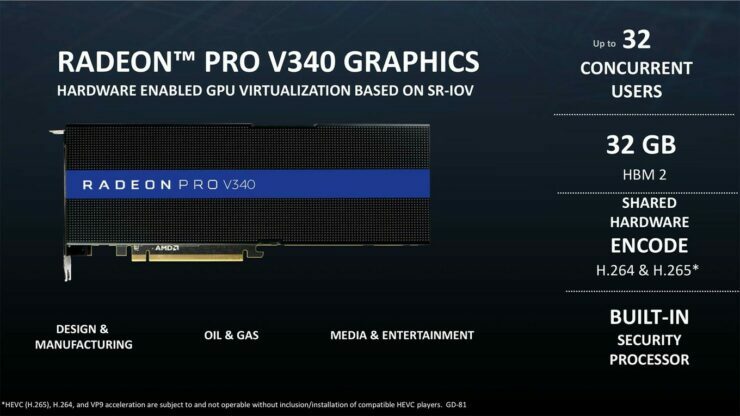 The card was quietly unveiled in a presentation given by Nick Pandher, Director of Market Developement Professional Graphics at AMD during a chinese press event. The card is one of the first AMD cards to feature 32 GB of HBM2 memory and is essentially 2 Vega 10s running in parallel. The graphics card is being purported as a virtualization solution with capacity for 32 users. Cloud providers that offer computing resources as a service can utilize this card to greatly increase flexibility and allow multiple users to use resources at the same time. The drivers for this card already exist and its codenamed AMD686C.4 or in other words the AMD Radeon Pro V340 MxGPU where MxGPU stands for multi-GPU solution. Interestingly, the card has hardware support for HEVC or H265 which is one of the codecs with a growing demand out there right now. The slides also mention a security processor which I assume is somethign similar to the ones found on AMD processors and maintains the virtualization layer and keeps the virtual environment detached and unaccessible by the cloud provider. This is something that can be a very attractive feature since it means that it would be virtually impossible (hacks like Spectre excepted) for the cloud provider itself to gain access to any of the user data thats running in the virtualized enviroonment. Another key development is native support for Adobe CC being introduced for the Radeon SSG family. I cannot state how big of a deal this is. I have worked in the amateur video industry and almost everyone I knew used NVIDIA GPUs primarily because of an ecosystem thats based entirely on CUDA tools. Adobe integrating native support for AMD cards is the first step for the company to start breaking into the closed down ecosystem of the professional video world and actually allow its GPUs to put their hardware to the test.